I had my life story, or at least part of it published by Avon Publishing in 1999. Yep, I'm an author!. The title of the book is "Looking for Lost Bird". If none of my old friends want to read, then keep an eye out on Nov. 19th of 2000 and you can watch it on T.V. Hallmark Hall of Fame made a movie from my book and I guess I have my english teachers at Far Rock to thank. By the way, does anyone know what became of Jeff Rubin? I believe he was in the class of 73. Can you post this on the 1973 page? Fellow Classmates from 1973-- I recently received the following email regarding an inquiry for a dear friend, Steven Elkin. "I am writing to you from the Alumni Affairs office at Queens College. Unfortunately, the letter we forwarded to Steven Elkin was returned to us. 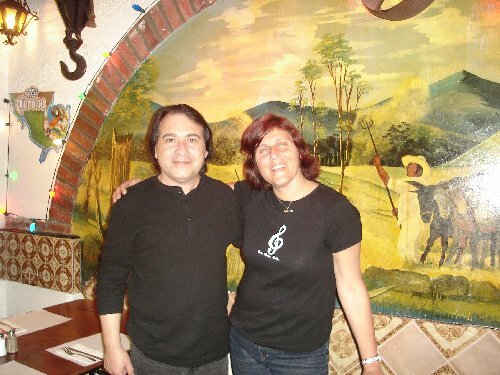 I am sorry to have to tell you that it seems Mr. Elkin has passed away. We have no other information. I have coded our database to reflect deceased and am sorry for this disturbing news. Thank you for being in touch with Queens College!" Steven was one of the many of us who went onto Queens College. We lost touch after graduation when Steven was planning to go to medical school in Nebraska, followed by a residency in Wyoming. Does anyone know of any information regarding Steven? I'm hoping that the information I received from Queens College is actually an error. For myself, I live outside of Chicago in a neighborhood not unlike the Far Rockaway of our times. My son is now attending the high school which reminds of FRHS. The football team/games are big events, the school is brick with many additions but it doesn't have the coal heating train in the basement. Remember telling subs that we had a subway running through the school? I have 2 kids (14 & 10) and a dog. 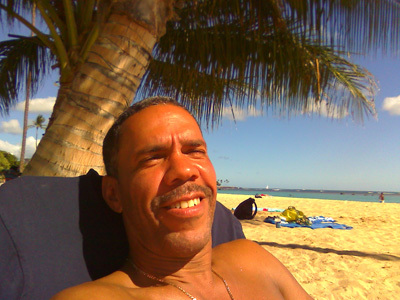 My husband of 20 years is from Hollis Queens (met at Queens College). Our house is over 90 years old and is the process of renovations. Currently, I am at Northwestern University at the Animal Research Facility but have spent most of my career in pharmaceutical manufacturing. I have enjoyed hearing from so many of my old friends. Each time I pull out my yearbook to remember what we looked like back then. 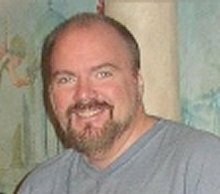 Psychotherapist/Entrepreneur Musician Extrordinaire, Artist Excellsiore All-around-great-guy (great sense of humor developed to "par excellence" over the years!!! 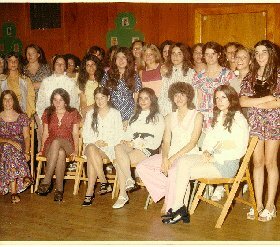 Sharon Bluestone Goldman writes to ask if anyone is planning a 25th year reunion for the Class of 1973? I am married to Larry for 22 years. We have 2 sons. Matthew is 17 and Michael is 14. I am an accountant. Walter Rutherford, Class of 1973, joins us from Williston, FL and shares the following. "Thanks for letting be a part (or I hope so) of the effort. I will have to search my photo albums for photos of Far Rock but I am sure there are a few that have survived. I graduated in "73" and still have many fond memeories of that place. I will search and send them as soon as I can. In the South Florida area there are a number of FRHS grads that get together about once a month for breakfast. The grads are from all years (50's 60's 70's). They have been known to have local cookouts, picnics and rumor has it that this July they are planning a large reunion in the Fort Lauderdale area. Location and dates of breakfasts are sent via email and turnouts to these events are usually 10 to 20 strong (for breakfast that is not bad!). Anyone who would like to attend send an email to sungun@aksi.net and they will be put on the email list. It is my pleasure to contribute to the continuence of this noble effort. May those who come after us see this as our way of never giving up. No matter where our lives take us, no matter how far we may roam....just a couple of clicks and presto... we are home! Thanks to Walter for his contribution. Walter, send me those photos. Too many mailbags, not enough pictures. Joy Goldberg (Saldinger), Class of 1973, joins us from Annapolis, MD and writes the following. Skip, Thanks for all the work you have done on the web site - it's great. I graduated in 1973 and currently reside in Annapolis, MD with my husband Mark and 7 year old son, Elliott. I have been working for the IRS for the past 18 1/2 years. Currently, I work at the IRS headquarters office in Washington, DC. My mom still lives in Rockaway (Dayton) and we visit several times a year. I now show my son where I went to school...he thinks it was in the "olden days". It sure does seem like a long time ago; however, the memories make it seem like yesterday. I would love to hear from anyone living or visiting the Washington, DC - Baltimore area. Folks can visit the family web site at markgoldberg.com/mje. I look forward to the September reunion. Thanks Joy for writing. I look forward to hearing from you again. How about a graduation photo from the yearbook? Michele Grosso, Class of 1973, joins us from Uxbridge, MA and writes the following. I could have sworn I answered your e-mail back. It went something like this. Yes. I am Michele Grosso. These are my pictures from my Sweet 16 on August 8, 1971. It was held at the American Irish Hall, 1 Shamrock Drive off of Beach Channel Drive, around Beach 80th Street. I just recently drove by there, and it is nothing but a broken down shell of a building. But then again, a lot of Rockaway is now like that. Anyway, my party was on a Sunday afternoon. 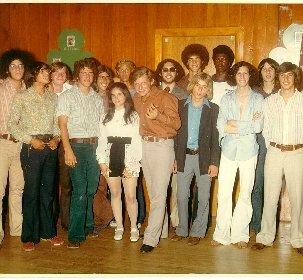 Many of those who attended were from the class of 1972 and of course, 1973. That is the year I graduated from the "rock". 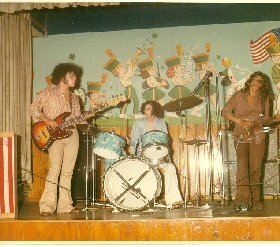 The band that played consisted of Louie Echavaria on drums, class of 1972, John Morales on Lead, Class of 1972, and Scott Lask on bass, Class of 1973. What else can I tell you. I am currently working on Wall Street for a computer service for about 9 years now. I live in Bayridge, Brooklyn and living happily ever after with my sweetheart of 13 years who is one of New York's Finest. When I was in high school I worked as a waitress at the Wavecrest Corner restaurant. So, I hope you can use the pictures for your web site. Thanks so much Michele for the letter and the photos. I'm sorry it's taken so long to get them on the web site. It was worth the wait. They're great! I use to go into the Wavecrest Corner all the time. I worked in the supermarket when it was called Food Fair. I'm sure we've met. Do you remember Steve Schwartz? He use to sell stuff from his car right in front of the Wavecrest Corner. He was a real character. One of a kind. Rory Simmons, Class of 1973, joins us from Scottsdale, AZ, his new location, and writes the following. I have relocated my business and family to Scottsdale, AZ and we'll be buying a home down here soon. My e-mail will remain the same wherever we go. We're involved in an e-commerce business and have franchising opportunities to others interested in their own business. Hello to all FRHS alum from the early 1970's who may know myself and my older brother Dwight. We were active in Boy Scout Troop 409 as well as Edgemere Jewish Center so if you were a part of that please stay in touch. We lived in Edgemere at 411 B. 54th and Nordeck Co-Ops at 325 B. 59th. Both my brother and I went to PS 105 and JHS 180 but I attended 5th and 6th grade at PS 42. WOW! I really remember quite a few people listed on your page from around 1972 - 1974 because I probably should have graduated sometime around 1973. I believe Michelle Grosso was in a few of my classes! It was quite a hazy time in my life but things have really come together for me since leaving NYC in 1978. My Far Rockaway experience stems from the Winter of 1960 when my parents moved my brother Dwight and I to Edgemere apartments. We lived at 411 Beach 54th on the top floor. Last time I drove through I was crying at the way things have turned out now. We moved to the Nordeck < sp > co-ops where I stayed with my parents until I left in 1973 to head west. I remember Michelle Simon and her brother < twins > were downstairs neighbors. After leaving NYC in 1973 to head west for about 3 years I returned home to my parents house in Yonkers, where I stayed until 1978. I again left for the west coast and never returned. I am now a computer consultant working for Boeing in Seattle. I married a very sweet girl I met in SF and we now have a girl 3 and boy 7. My life has really turned out way better then I ever expected it could. My fond memories of being raised in Far Rockaway include Playland, where I worked for the Geist family for a few Summers. I worked some arcade games, the roller coaster and janotorial duties. Other memories include the YMCA dances next to FRHS, Falcaros bowling alley until it burned down, fireworks every Wednesday in July, Harry smoked a fat cigar all the time the Good Humor man, Pops I think hotdog cart at Beach 54th and Beach Channel Drive, Boy Scout troop and Cub Scout pack 409 and Explorer troop 348, Benny the traffic cop on Central Avenue, all the stores along Rockaway Beach Blvd, Mrs Ahearn the crossing guard at PS 105 and many many friends who I palled around with, many I see on your pages. Thanks Rory for your letter and memories of Rockaway. I know that those of us who have visited recently, share your feelings about what has become of our childhood playground. Mark Coopersmith, Class of 1973, joins us from Chicago, IL and writes the following. Update 2009 - Just informing you of a change of my email address. It's isserking@aol.com. Moved my family back to Israel in July but I kept my job at Northwestern University. Hell of a commute. Just spent a wonderful five days in Far Rockaway and Cedarhurst in September. Hi to all. 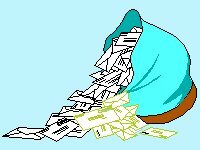 Sorry I haven't been in touch but my hard drive was wiped and I lost all my addresses and websites. I just updated my new info. Got remarried in June 2002 and am living in Chicago. Boy, do I miss the Miami weather! Planning on opening a restaurant in downtown Chicago in the near future. Soups and salads for the business crowd, really, with some special touches. I have a catchy name that I'll reveal when I open. All alumni welcome for a free lunch. I used to bowl at Falcaro's, eat at China House, Cairo's, Gino's, Central Deli (knew the owners), Carvel (owned by Ronnie Cozzalino's dad), Zomick's. 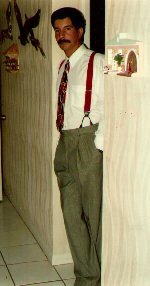 I was bar Mitzvahed at Temple Emanuel on Central and bought clothing at Morton's. I remember the Pix and the Town theaters and stealing candy from Grant's. I worked at Playland selling tickets in the summer of 73. I went to driver's Ed at Stella Maris. I remember my mom taking me home by the hand from my aunt's apt. at 349 Bch.57th (I was at 324 Bch 59th) when Hurricane Donna hit and the bay met the ocean on my block. I used to ride my bike up and down the boardwalk and played paddleball on 85th St. with Howard Babich. After we'd have a pizza at Dana's with a new soft drink called Sprite. I remember Met food and Waldbaums and P.S. 42 and JHS 198. I could go on and on. High shool was great! I had many friends and I'll never forget that part of my life. I'll try and be in Rockaway in September. Thank you for setting up this site. Looking for P.S. 42 alumni from the early to late 60s. I loved reading notes from friends from long ago, and it is so true about Rockaway never leaving our souls. It was the best place to grow up. Just found so many people I haven't thought of in years. I can't wait to get in touch with them. Hope to hear from some of you who might remember me to. I lived at 51-24 Beach Channel Dr. Attended PS 105, JHS 198 and FRHS. I loved the Rockaways and would like to hear from anyone who remembers me. Teri, formerly from Breezy Point, looking for Susan Abramowitz from Far Rockaway graduating class of 1973. Just wanted to share not one but two reunions on my cross country trip this year. Met my old friend, Artie Kapell, in Dallas . Then stopped in L.A. and met with Alan Porzio. It has been 36 years since we have seen each other. Great to catch up. Attended FRHS from 1969 to 1972; left one year early to go to college after 11th grade, but would have graduated with class of 1973. Great memories, especially of Mr. Ruf and band. I was learning to play the flute and he was so supportive...does anyone know anything about what became of Fred Ruf? Hey everyone...Yes it's the FORMER Debbie Conn who now and has been going by Susan Rice for 16 years. I left Florida in 1983 for the suuny state of California traveling with the Fred Astaire Corporation back then. The surfing out here brings back boardwalk/beach memories....and good ones from back in the 60's. I frequently visit back in Florida and would love all you party animals that frequented my B. 132nd St. house to make it to the Florida reunion in July......See ya... Susan....formally DConn "Roach Killer"
Just informing you of a change of my email address. It's isserking@aol.com. Moved my family back to Israel in July but I kept my job at Northwestern University. Hell of a commute. Just spent a wonderful five days in Far Rockaway and Cedarhurst in September. and continue to have good memories of my childhood hometown. Didn't move far, I'm a Long Islander now. I still have a very close friend from there. What happened to all those people who used to hang at 17th St. and play music until the sun came up? Now that I've got a garage I don't have anyone to join the band. I graduated in 73. I got married in 78, had my first daughter in 81, second in 89. Had lived in Forest Hills for a number of years, then moved to upstate NY. We love it here. I am a Dental Assistant for a Periodontics in Monroe, NY. I still keep in touch with a lot of my friends from Rockaway. We still talk about the days from FRHS. I miss that time. Would like to contact people from that time to see what everyone did or didn't do after HS. Married to Mark for 1 year. Have 2 sons: Eric 14, and Jason 11. Hope to hear from my old buddies. If any of the Bayswater boys and girls are looking to get together I would love to hear from you guys. Mass. is not that far from N.Y. and maybe we can have our own little get together! 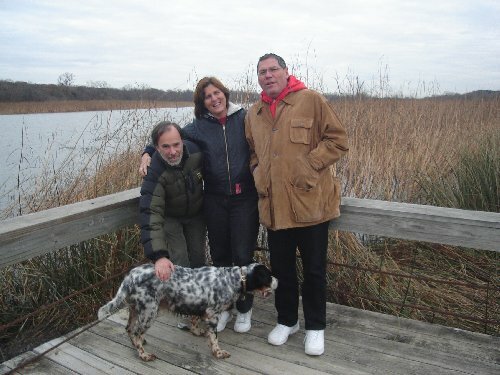 I now reside in Commack , N.Y. with my husband Jack and my two daughters. My oldest just got married after getting her masters degree in Social Work. My little one (13) is attending Commack Middle School. I have been busy with my business. I own an online travel agency. I would love to hear from any of my old friends from class of 73. It has been sooo many years. I have such great memories from that time. For those who know me no explanation necessary. For those who don't no explanation possible! Hello, old friends. I've changed e-mail addresses, hence, this new listing. I hope to find even more of my old cronies and catch up a bit.I'm an unplugged 60s rocker. I sing and play my old guitar, preferably with those who were there back in the day. Hi 1973 gang, would love to here from you all. I'm married to a wonderful man. I have two boys, One is in college and the other in high school. And about myself, I'm working with five year olds which makes me feel young. I would love to talk to my old high school friends and listen to all the memories. It would be a blast from the past. Hi Everyone! I grew up in Bayswater. I graduated from JHS 180 in '73 and only attended FRHS for less than 1 year, but I grew up with all you guys from PS 104. I was in the 2 YR SP class at 180. I remember Milty's candy shop and walking into "town" to catch the early bus to get to chorus rehearsal with Mr. DiNapoli. Hanging out at Beach 17th St, the Hartman Y Day camp ("oh pity me"). Contact me if you share these memories. Yo! Typically untypical I'm married have an awesome wife and two daughters Hadley Rose 31/2yrs and Alexmarie five mo. old. Job-wise, I design/test ISDN and ADSL Systems for telecomm company. Hello old friends! Thanks to Michele Blashka for telling me about this site! I'd love to hear from anyone who wants to share memories....it made me feel so good to see many old friends' names listed here. I graduated Brooklyn College in 1977. My husband and I moved to Florida in 1980 and we've been here since then. We have two daughters 16 & 13. When my older daughter comes home with her High School stories, boy can I relate! Nothing changes, just the players! Hope to hear from you soon. After graduation in 1973,I went to school in St. Louis. Eight years later,I settled in Alexandria, Virginia and opened my dental practice. My parents still live in Belle Harbor so I can still get to the beach. I would love to hear from my classmates from P.S 114 and J.H.S. 180 too. 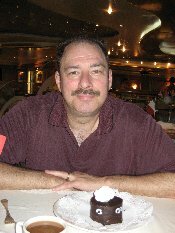 Does any one know where Matthew Weinstein is? Great website!! Wow! Saw some names that go back to PS 215 when I first entered the States; it really has been a long time… and yet, there is so much more. Loving life with a new addition, Sophia, 11 months. Cheers to all. I attended PS 42 and Cardoza JH 198 and due to the changes taking place in Rockaway my family moved to Centereach where I did graduate in 73, but very much missed not going to Far Rock H.S. with all my childhood friends. I would very much like to be able to get in touch with all the people I grew up with and always missed not graduating with. My teenage years growing up in Rockaway were probably the best I've known. I would not trade the friends and relationships I had for anything. I hope to hear from some of my old friends so we can walk down memory lane together. Looking forward to the thirty year reunion. I know I am in trouble with some of you guys but remember I still love and miss you. I am married and have five children and I live down the Jersey shore because I couldn't get the sand out of my shoes. I remember Far Rockaway high like it was yesterday. I bet a lot of people remember my brother Jimmy and the parties at my house. Nice to connect with anyboby. I remember Yuggie and Debbie Conn and Susan Posner. I am a NYC teacher at Flushing High School. This IS the voice of Argo Speaking! This is an incredible experience getting in touch with my friends from the past. I hope to make it to the next reunion. Life is wonderful!! Looking for a long lost class mate and good friend Michael Brown. If you're out there drop a line. Ruth Paris is visiting from Boston today and her 3 girls and my 2 girls are running wild. Anyone want to meet at George's house? There is a party!! I went to PS 215, JHS 198 and Brooklyn College after HS. Would love to hear from Sharon Kolokoff, Barbara & Janet Klapper, Valerie Kerner, and other people I miss. Valerie...I tried to e-mail you...we live close. Many years have passed since my high school graduation. I have very fond memories of FRHS. Sadly, I didn't keep in touch! I just found this website & I'm enjoying it. Thank you! You are doing a great job. Maybe, I will attend the next reunion. As my younger son is a freshman in college this year, I'm definitely feeling the empty nest. Work keep me busy, but I need a change. I have been contemplating returning to school. If you remember me, please get in touch. I would love to hear from some of my old classmates. I miss the old days, but I guess we all had to grow up. I am the proud parent of two boys. Michael who is in law school, and my younger son Matthew who is attending the University of Buffalo. I have a lovely wife, to whom I am married to for 25 years and still going strong. I work as a New York Ciy High School teacher, and I own a business on the side. I own a defensive driving school. Good wishes to all. Would love to hear from other alums in the Washington, DC, Virginia, and Maryland vicinity. I went to Far Rock between 1969 and 1972. I did not graduate because my father passed away and we moved to California. I was just looking to be listed in case there is any one out there who would remember me. I went to St. Mary's all through grade school and graduated from there in 1969. I tried the St. Mary's Alumni link, but it had been taken down. Thanks for your help. One thing I definitely remember about the 1973 graduation ceremony was Winston Cornwall noting that we were the first graduation class that did not have to worry about the draft. I tell that to my students when I teach them about Vietnam. Didn't graudate cuz I had to move to Brooklyn. Looking for Mr. Greenberg's sixth grade class and other friends from the projects. You too, Jeffery Einbein. To all my old friends -- hope your lives turned out happy and healthy. I graduated Far Rockaway High School in January, 1973. My mother went to FRHS as did two of my uncles and aunts! My grandmother came to the Rockaways when she was six! Everyone was saddened that an era is over with the closing of the school...but it's just not the same, is it? Thank you for such a lovely walk down memory lane and thanks for including me! Just found this site, think it's great. Keep up the good work! I would love to hear from graduates of 1972 and 1973. I am still living in the New York area, and sometimes even run into some Far Rock. graduates or their parents. Can't believe it has been so many years. Hello to everybody. Even though much time has passed we all remember so much of the Rock- it's pretty cool.